I often make salad for lunch out of left-overs. There always seems to be something to use up, and I like creating a fresh new dish from a previous delicious meal. Plus I hate to throw any food away; even a few spoons of rice or a small piece of cheese get put in the fridge. So, I combine the two with torn lettuce, add orange and cucumber, toss everything with a quick dressing and there you go: Lunch. Why would I throw away those spoons of rice? Or that piece of cheese? It’s just enough for salad. Some left-over baked salmon and potatoes, with olives, fresh slices of cucumber, greens and oil/vinegar. Cold rice or quinoa added to arugula with some fresh peppers and slices of apple, sunflower seeds and mustard-y dressing. 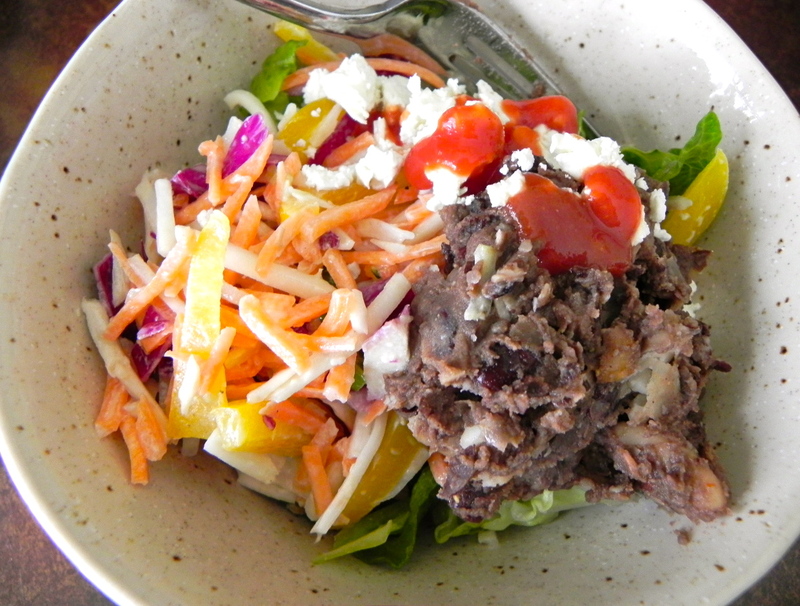 Bean taco filling with cabbage salad, tomatoes, crisp lettuce and crumbly cheese. And, of course, taco sauce or salsa verde. Really, look at this delicious taco-ish bowl of salad. Who needs taco shells when these left-overs make such a great lunch salad? Most left-overs in the fridge can be part of a salad, especially if you open your mind to it. Why not add rice or quinoa or lentils? Check to see what you have in the pantry, and add some chopped nuts or raisins. Go ahead, grate some cheese over the top. Fish, rice, beans… how do you use your left-overs? Salad, a new dish, or as is? I’m curious to know.